Spinal manipulation goes by several different popular terms: spinal manipulation therapy (SMT), chiropractic treatment, chiropractic manipulation, chiropractic adjustment, and spinal adjustment. Most people know it by the audible effect of the treatment: “joint popping, back popping, neck popping.” Beyond that, the science and clinical rationale for spinal manipulation is not commonly known. This is unfortunate, because the science behind spinal manipulation is real and understandable. At Cole Pain Therapy Group, spinal manipulation is often used as a component to the treatment of neuromusculoskeletal pain problems. So, for spinal manipulation to be effective, there needs to be a spine joint problem to be manipulated. Joints of the spine that are not moving in the right amounts or in the right direction are “fixated”. The joint is tight and stuck. If the joint is newly stuck, there will be inflammation at that level of the spine, pain with attempted motion or pressure at that level, and changes in how the muscles support the joint. It is the job of the muscles to move the joint and the job of the joint to move. When this relationship is not working correctly, pain and stiffness results. If the motion of the spine joint has been stuck for months or years, joint degeneration (i.e. arthritis), adhesion of the joint capsule, and atrophy of the supporting muscles will eventually occur. The actual process of spinal manipulation, therefore, starts with the doctor using his hands to analyze spine motion to detect joints that are not moving as they should. He then applies a comfortable thrust of the joints in the right direction of motion. The immediate effect is an increase in the joints range of motion, a release of pain suppressing chemicals, and improved muscular support of the joints. The most common side-effect is a mild soreness or discomfort lasting from 4-12hrs. People usually describe this as “post-exercise” soreness. 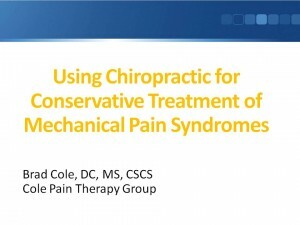 The important thing to understand regarding spinal manipulation applied by doctors at Cole Pain Therapy Group is that it is a customized treatment. Every patient is different. Those with osteoporosis, inflammatory arthritis, previous spine surgeries, mobility problems, and pediatric patients can still receive skilled treatment by a doctor of chiropractic who is focused on delivering the right treatment, for the right problem, at the right time, and in the right way. Spinal manipulation is applied as part of a customized course of treatment. At a certain dose, the effect of manipulation is cumulative and complementary to other necessary treatments to help you achieve your goals. If you have questions about whether spinal manipulation would be an appropriate treatment for you, please do not hesitate to contact us and talk to one of our doctors. This presentation contains the research citations for the effects of joint fixation and manipulation.